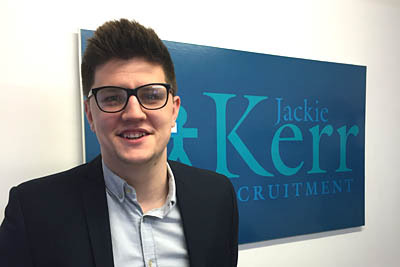 We are delighted to announce that Jackie Kerr Recruitment is continuing to expand. Whilst Jackie herself has almost 30 years' experience in recruiting in practically every industry sector you can think of... and at all levels including senior management, we always enjoy adding new experience into our team. We are proud to welcome James Slatter to the team. James Slatter will work as one of our Permanent Consultants to cover the IT, accountancy and finance sectors. James graduated from Leeds University and was a talented rugby player, playing for Bath and England Youth before starting his career working for a specialist sales and marketing agency. James has a wide range of experience in both executive search and graduate recruitment and we are delighted to welcome him on board. James joins Fraser, our Permanent Consultant, who has been with us for over three years, and who will continue to cover commercial and office support, construction and property, engineering, health care and medical, HR, legal, manufacturing, and marketing sectors including traditional media and creative marketing, and the ever-growing digital and online marketing sector. Fraser has specialist contacts in these areas and he will continue to grow and maintain these relationships. Other star employees include Calum, who has been with us for over 5 years and he will now take over full responsibility for managing our Temporary Recruitment Desk - covering all industry sectors for Temporary, Interim and Contractor hire. We're a close knit bunch and we work together really well. As your partners, Jackie Kerr Recruitment will get to know your culture and your ethics, your work time and your fun time, your ambitions for the business, and will therefore be able to recruit the best candidates for your organisation, whilst you concentrate on what you do best - running the business and increasing profitable productivity.